Voters line up to cast their ballots at a polling station set up at Grady High School for the mid-term elections on November 6, 2018 in Atlanta, Georgia. Georgia has a tight race to elect the state's next Governor. FORT LAUDERDALE, Fla. (AP) - The Florida attorney who pushed the state initiative legalizing medical marijuana has a new target -- increasing the state's minimum wage to $15 an hour. 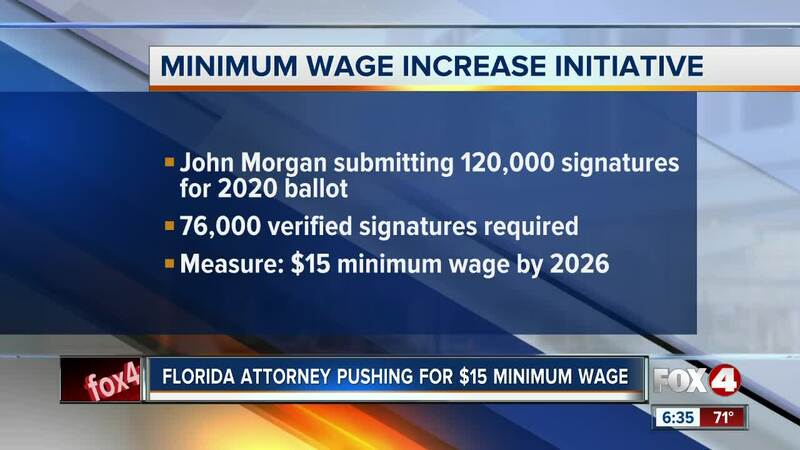 John Morgan told an Orlando news conference Tuesday that he is submitting 120,000 signatures to get an initiative on the state's 2020 ballot, well over the 76,000 verified signatures required. The measure calls for raising the state's current minimum wage from $8.46 an hour to $10 in 2021 with $1 an hour increases annually until it reaches $15 in 2026. Morgan said the increase will benefit companies through lower turnover and help taxpayers as the government won't have to subsidize low-income workers through welfare payments. Republican Gov. Ron DeSantis' office declined immediate comment and the Florida Chamber of Commerce did not immediately return a call.